In his book Theme and Variations, published in 1972, famous violinist Yehudi Menuhin noted, “Improvisation is not the expression of accident, but rather of the accumulated yearnings, dreams and wisdom of our very soul.” Though he was referring to art in general and music in particular, the same proposition applies to other creative fields as well, like design and architecture. Most of the architectural marvels of the ancient and modern world are results of such improvisations that made them immortal. Without this essential quality, the world of art and architecture would have never managed to be what it is today. 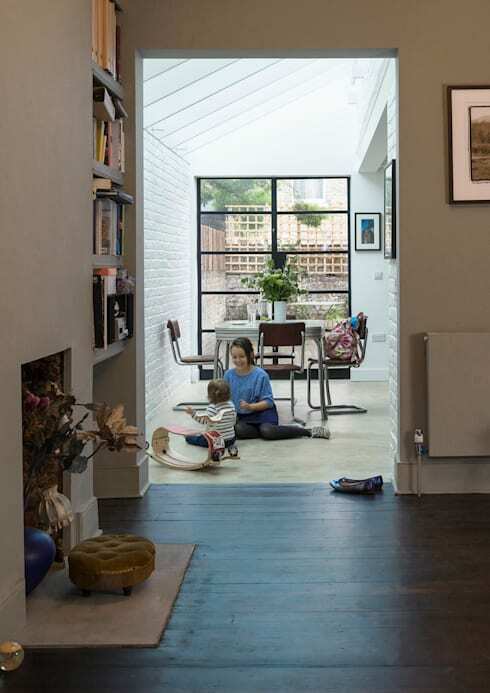 While redesigning this Victorian house, Mustard Architects too needed to tap their resourcefulness. They have made a number of changes in the interior, which we will shortly review, and also added an extension. Which once was a dark and narrow building received a stunning makeover in the hands of the architects’. This home improvement project won them critical acclaim and third place in the 2014 competition of Don’t Move, Improve! 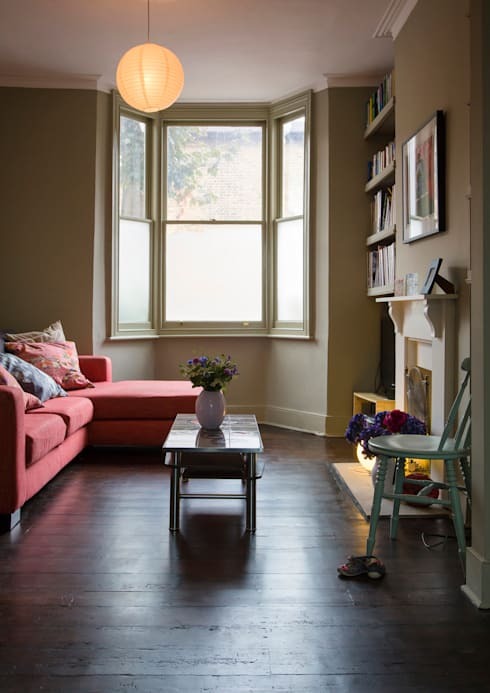 In helping to create an expansive looking living room, the classical bay window proved to be a blessing in disguise. Modern householder’s tastes warranted the presence of a sectional sofa upholstered in bright fabric. A simple coffee table, chair and wall mounted bookcases are the other prominent features of this cosy space. Chic lighting fixtures induce an element of cheer. The striking presence of dark wooden floor and an unfussy colour scheme deserve special mention. 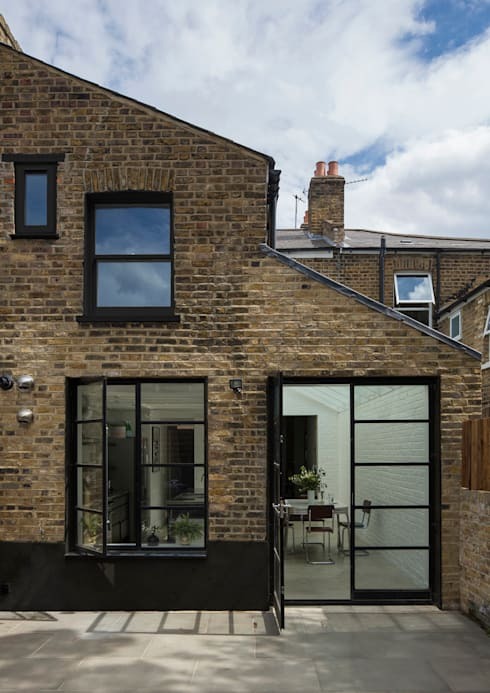 This Victorian house, lovingly called Raw house, has underwent several structural alterations. 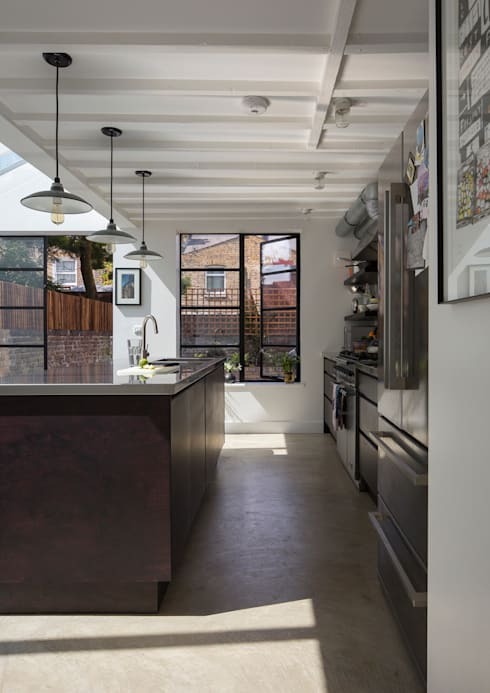 This type of refurbishment is becoming increasingly common in large and densely populated cities like London where space comes only at a premium. The dark and cluttered space gave way to an elegant family home. It was also decked following industrial design philosophy which is another highly unusual plan for a Victorian structure. It would not be incorrect to note that the open plan kitchen is the focal point of the building. It is here that extensions have been built to create an expansive interior. Extensive skylight installations and windows allow uninhibited flow of natural light and air. Raw concrete, brick, metal and timber – constituting the four pillars of the construction – make their presence felt here. This is largely due to the notable handling of these materials. 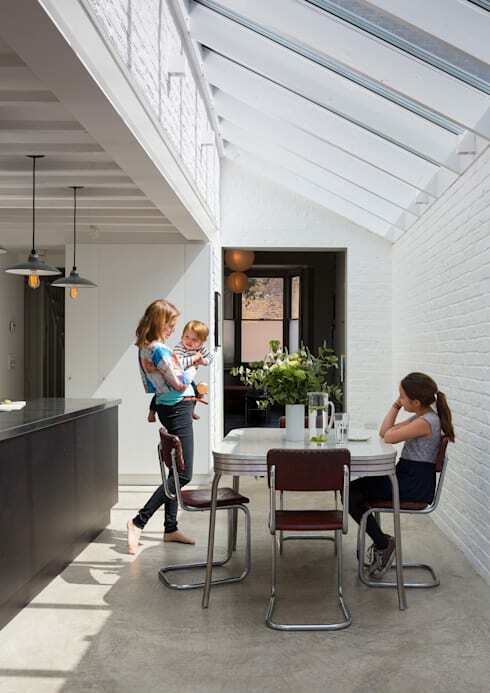 For instance, coating the exposed brick wall with white paint or treating the wooden beams in very much the same way. Dark and woody texture of the kitchen counters and storage units create a stark contrast to the spotless white tone of the walls and ceiling. Wall mounted ledges provide additional storage space. 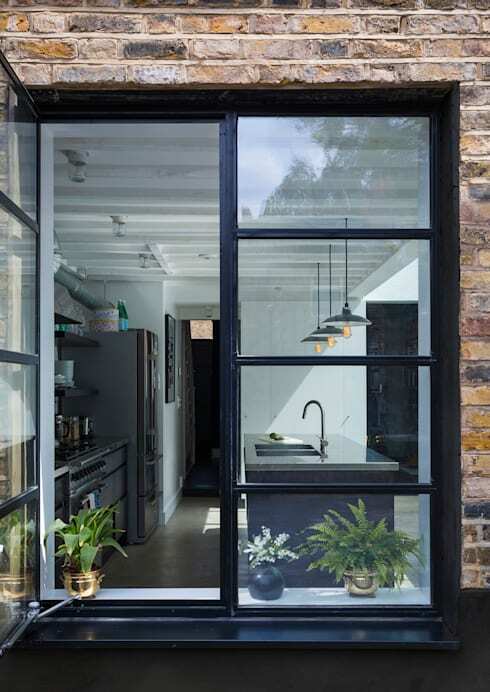 Crittoll steel framed windows and door accentuate the industrial aestheticism of the area. Views of the small garden can be obtained through the glass panes. Fashionable pendant lighting acts as a utility driven decorative feature. To light up your rooms the proper way use beautiful lighting fixtures along with classy windows. Both of them are highly useful to inject an element of geniality in the ambience. 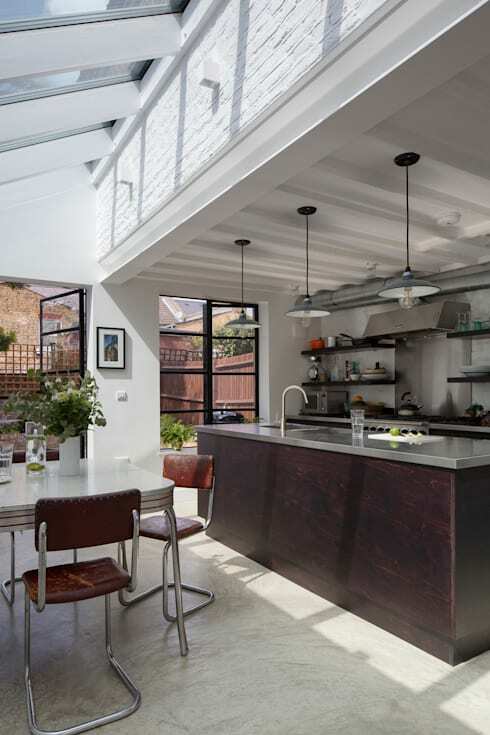 As is the norm with open plan design, the dining area shares its space with kitchen. The extended portion of the house is utilised to set up this dining space. This area is stripped to bare essentials and except for a squarish table and low key chairs have precious little to show off. Space constraint does not allow any further addition of furniture or decorative items. The fusion of vintage and contemporary aspects of design is well evident from the outside. The brick façade of the building is a reminder of the past glory whereas the interior is a product of the modern era. The structure is repurposed to suit the requirements of a modern family. A combination of casement, single hung and stationery windows and doors have been employed to brighten up the interior. The small courtyard provides an opportunity of reconnecting with nature even while being at the heart of a city. Glimpses of the neighbourhood, studded with more Victorian-era houses, can also be obtained from here. This house also contains such features that are not apparent to the naked eye. It has under floor heating and highly efficient wall and floor insulation. Triple glazed roof light with solar control glazing maintain optimal heat under extreme cold and hot weather conditions. The newer structures also make as much use of sustainable materials as possible. Most importantly the designers have showed great capabilities of improvisation to create a comfortable family home to the satisfaction of the present owners.